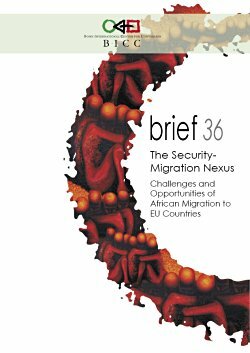 BICC brief 36 documents the papers and speeches presented at the conference “The Security-Migration Nexus: Challenges and Opportunities of African Migration to EU Countries” which was held at Bonn, 22–23 February 2008. The event was commissioned by the German Federal Ministry for Economic Cooperation and Development (BMZ) and brought together 150 experts from academia, political and civil society institutions as well as diaspora representatives not only from Germany, but from different European countries. Trying to incorporate the security needs and aspects of all affected stakeholders, that is the societies in the countries of origin and residence and in particular the migrants themselves, the first conference day was dedicated to discussing the ‘Feasibility of Triple-Win’ from a research perspective. It started with the wide ranging and thought provoking keynote speech of Prof. Rita Süssmuth, the former President of the German Federal Parliament. Building on these results and findings, the second conference day followed up these debates by focusing on practical and applied policy implications of these issues for both state and non-state actors. Among the stakeholders involved in these discussions were representatives of the German Federal Agency for Migration and Refugees (BAMF), the Migration for Development in Africa program of the International Organization for Migration, the Federation of African Associations in NRW, the German Technical Coorporation (GTZ), the German Development Bank (KfW), as well as of the African Rally for Peace and Development (ARPD).